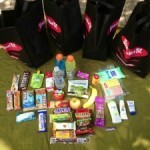 What goes into the care bags? I believe the most beneficial aspect of making and delivering these bags is what the bags demonstrate to the recipient. Its the caring, the thought and the energy of making them and delivering for someone as a simple gesture of kindness. The care bags are a vehicle to make connections. I recommend using paper bags (for environmental reasons), ask any grocery store to assist with this. Just remember to be safe and cautious; you can hand the bags out your car window. The rule in which I follow is to never give anything you wouldn’t want yourself. The homeless are people with brothers and sisters, with parents and children. Treat them as you would your friends or family, treat them with respect and dignity. Treat the bags as if you were making it for your best friend. Remember this when you make your care bags. 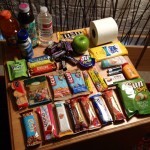 Food Items: Here are just some examples of what you can put in your care bags. Anything that is self contained is great. Non-Food Items: Separate the toiletries into gallon zip-loc bags. This will help keep the food fresh and not influenced by the perfumes of the toiletries. Information about local shelters/food pantries/assistance programs and what they do. Do some research and find out what services exist in your community for the homeless and addiction services (print and place in an envelope). Blankets, winter wear (coats, scarves, gloves, etc), cold weather sleeping bags, wet-wipes, adult vitamins, toothbrush, deodorant, toothpaste, finger nail clippers/file kit, first aid kit/supplies, small flashlight, paper/notebooks/pens, chapstick, gallon zip-loc bags, quart zip-loc bags, gold bond powder (travel size), lotion (travel size), tissue (travel size), roll of toilet tissue, antacid tablets (travel size), sunscreen (travel size), emergency mylar blankets (travel size), poncho (travel size), anti-diarrheal tablets (travel size), socks, mini soap bars, shampoo/conditioner (travel size), Reading glasses, folding/travel silverware, gift cards to local stores like Target, local fast food gift cards, hand towels, t-shirts, feminine hygiene products, back packs, hand warmers, toe warmers. Expired food items, Alcohol, hand sanitizer, over the counter pills/medication, mouthwash, homemade food items (unless trust is established), high alcohol content toiletry items, tobacco, soda, canned items. I found the information regarding the care bags on the hideout website. This sounds like an amazing program and I would love the opportunity to assist in any way I can. After reading all the information given, I have a few questions as to how exactly I begin. I live in the Northwest suburbs and am not at all familiar with the city(I could probably count the times I’ve been there on one hand). I did read that care bags are distributed in the Logan Park area, with Google maps and GPS, that part should be simple enough. It mentioned to use paper bags to compile the care package in. ~Could I possibly use backpacks or those cloth bags people use when they go grocery shopping instead? In regards to including info packets on shelters, food pantries and local community assistance programs, I’m assuming that would be easy enough done via the internet, but do I only include resources for the Logan Square area? Would including something such as bus passes in the care bags be helpful? Also, my biggest question/concern arose when it was mentioned about not getting out of your vehicle, but handing the bags out the window. This is probably where my ignorance comes in, but is the idea to literally just pull over and hand the bags to people on the street. Will it be fairly obvious, which people I should be giving the bags to? I wouldn’t want to upset or insult anyone. I’m sure that last part sounds stupid, and I apologize. I would very much like to help, but don’t want to do it incorrectly, either. Thank you so much for what you’re doing and for any additional info you can provide. 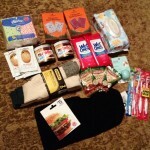 Thank you for writing Amy, I do distribute the care bags in the Logan Square area. I think its important for several reasons to do this work in your community. I started handing the bags out my car window, only in the beginning. Now I park my car and stop for a talk; I’ve gotten to know these people better over time and its much better to spend some time with some good conversation.